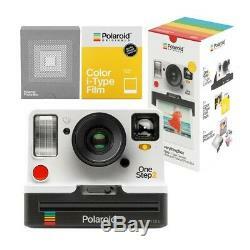 Polaroid Originals OneStep 2 VF White Everything Kit. 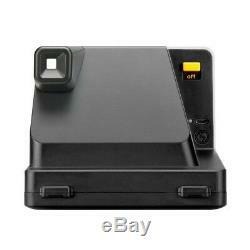 Accepts i-Type & 600 instant film. Minimum focus: 2' to infinity. Includes camera, neck strap & USB charging cable. Everything Kit includes, i-Type colour film & photo box. Based on the original Polaroid OneStep from 1977, the OneStep VF from Polaroid Originals is a contemporary take on the classic instant film camera. Designed to be simple and easy to use, this camera accepts both i-Type and 600 instant films to produce 3.1x3.1 prints and has true point and shoot functionality. With only a few buttons and a simple, intuitive design, it's easy enough for a child to use (no matter how old you are). Every time you press the shutter thousands of chemical reactions ignite to create one real, unpolished, completely unique images. Thats the beauty of Polaroid. The fixed 106mm lens offers a comfortable filed of view for everyday shooting and its fixed focus design suits photographing subjects as close as 2' away. The built-in strobe flash and high-quality 2ft to infinity lens makes sure you always get a great picture. All you have to do is press the button. Don't Worry About Batteries. Powering the camera is a built-in 1100mAh lithium0ion battery oack, which is rated for up to 60-days of use per charge. The OneStep 2 VF works with all styles of i-Type and 600 film, giving you loads of choice and more freedom of expression. 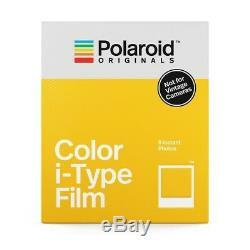 Eight instant colour photo films with white frames. Images begin to emerge within 2 minutes. Full development takes 20-30 minutes. This colour film formula produces photos with rich colour, well-balanced tones and those soft textures that makes analog photography so distinctive. 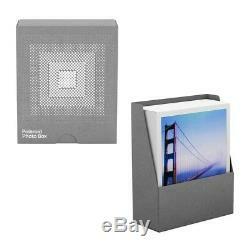 The Polaroid photo box, included in this kit, is a cardboard-construction box that can store up to 40 Polaroid photographs and have a notes section on the side. The storage box protects the photographs against dust and moisture and it is compatible with i-Type, 600 and SX-70 formats. 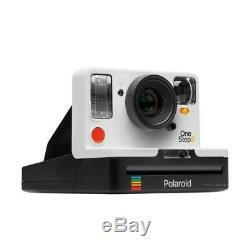 Accepts both i-Type and 600 instant film. Built-in lithium-ion battery pack, rechargeable via USB. Everything kit includes, camera, neck strap, USB charging cable, i-Type colour film and photo box. OneStep 2 VF White Everything Kit. Optical grade Polycarbonate and Acrylic lenses, coated. (L x W x H) 150 mm x 110 mm x 95 mm. Built-in lithium-ion battery pack rechargeable via USB. WHAT'S IN THE BOX. 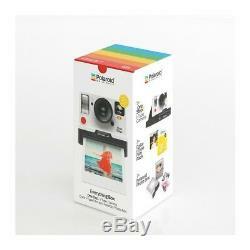 Polaroid OneStep 2 VF Camera White, Neck Strap, USB Charging Cable, Polaroid i-Type Colour Film and Polaroid Photo Box. They do not affect your statutory rights. Our terms & conditions may change at any time. Changes will take effect on the date they are posted. Before placing an order you are asked to read and accept these terms & conditions. At various stages during the ordering process and before finally submitting your order you will have the opportunity to check and correct any input errors. Your goods must be complete, unused and in'as new' condition e. If you have opened the box to examine the product you must have done so without damaging or marking the goods in any way. All software, CDs, must be sealed. It can also be worth sending it by a signed for or courier service. The seal has been broken on any software or consumables. The goods were special order to your specification. Guarantees do not cover faults caused by neglect, misuse or normal wear and tear. Batteries, film, ink cartridges, paper are not covered under the terms of the guarantee. When returning products you are advised to use an insured parcel service, which requires a signature, as we cannot be held responsible for products lost or damaged in transit. We make every effort to ensure that all information contained on this website is true and accurate. However errors can occur, if we discover an error in the price or description of any product you have ordered, we will notify you immediately and ask if you wish to proceed with your order. All images displayed on this website are provided for guidance only and are not always an exact match to the goods which will be supplied. Any other websites to which you link from this site are governed by their own terms and conditions. We accept no responsibility or liability for the content or operation of websites, which are not under our control. We are requested by law to inform you that sales can be concluded in English only and that no public filing requirements apply. 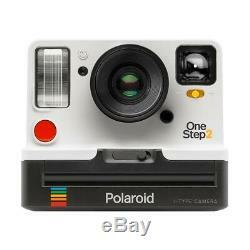 The item "Polaroid Originals OneStep 2 VF White Everything Kit" is in sale since Friday, January 18, 2019. This item is in the category "Cameras & Photography\Vintage Photography\Vintage Cameras\Instant Cameras". The seller is "wilkinsoncameras" and is located in Burnley. This item can be shipped to United Kingdom.